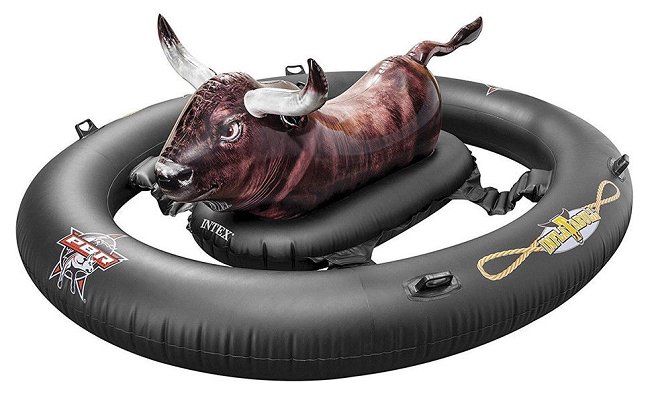 Why have a boring lilo when you can ride a rodeo bull in the pool? The Intex Inflatabull is designed for adults and children aged 9 or over, and it looks like a super fun game to play with friends or family. You just climb on the bull's back and hold onto the handle, as your friends each grab their own handle on the outer ring and try to shake you off! It has 3 air chambers and 5 heavy duty handles, with an outer ring for added safety and balance. This was originally selling for £60 when it was for sale on the old Tesco Direct site, then dropped to £56, so at £32 with free home delivery it's a bit of a bargain. we need to get this!! Who needs slides?! We’re gonna need a bigger pool!